Today USDJPY is under the influence of some economic news reports such as M2 Money Stock y/y and Tertiary Industry Activity m/m in Japan and the US is announcing Core Retail Sales m/m, Business Inventories m/m, the Revised UoM Inflation Expectations and Retail Sales m/m therefore this pair will be more active. USDJPY is finding support at 108.59 with resistance at 109.050 which both lines are above the weekly pivot point at 106.690. The pair is climbing the ascendant channel. The EMA of 10 is moving above the EMA of 50 suggesting the price growth over the last recent days. All indicators are showing buy signal; the price is above the Ichimoku Cloud and the Chinkou Span. The Kijun-sen and the Tenkan-sen show a horizontal movement. 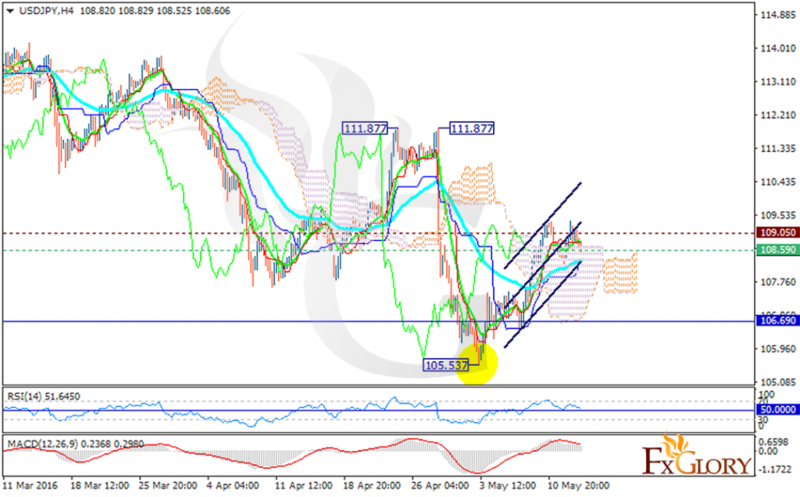 The MACD indicator is in positive territory confirming the buy signal and the RSI is above the 50 level. The resistance breakout will pave the way for 109.80.